Steven Kasher Gallery is proud to present Fred W. McDarrah: New York Scenes. The exhibition features 100 vintage black and white prints that span the late 1950s to the mid-1970s. The show features McDarrah’s most iconic images alongside never-before-seen work from his extensive archive. The exhibition launches the publication of the most comprehensive survey on the photographer, Fred W. McDarrah: New York Scenes, published by Abrams, which includes more than 270 illustrations and an introductory essay by Sean Wilentz. This is the gallery’s fourth solo exhibition of McDarrah’s work. The work of Fred W. McDarrah is having a massive resurgence. In addition to our exhibition and the new monograph, a solo exhibition Into the Artist’s World: Photographs by Fred W. McDarrah will open at the Parrish Art Museum in November 2018. Three additional solo exhibitions will open in 2018: Fred W. McDarrah as Mentor at Howl! 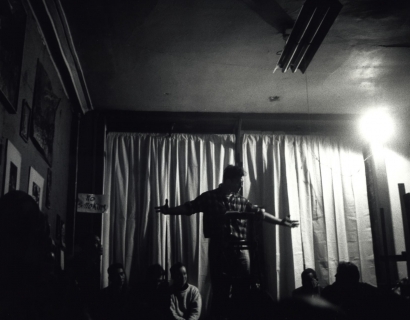 Arts, New York; Fred W. McDarrah: Imaging The Living Theater, 1968 at the Alchemical Theater Co., New York; and The Beat Generation: Photographs by Fred W. McDarrah at the Beat Museum, San Francisco. Fred W. McDarrah (1926 - 2007) was the only staff photographer at The Village Voice for decades and was its first picture editor. McDarrah was the eyes of The Voice. His pictures were the graphic expression of the United States’ first, largest and most spirited alternative weekly as it recorded -- and helped create -- the most vibrant decades of the greatest city in the world. Through the medium of The Voice many of his images are lodged in our collective memories of bohemia and the counterculture. He covered New York City’s diverse downtown scenes, producing an unmatched and encyclopedic visual record of people, movements, and events. 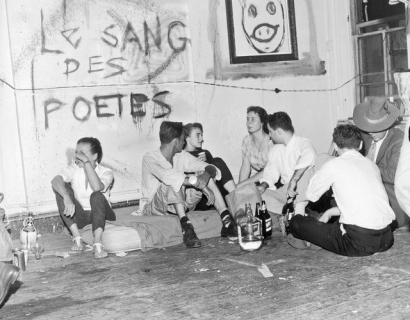 McDarrah frequented the bars, cafés, and galleries where writers, artists, and musicians gathered, and he was welcome in the apartments and lofts of the city’s avant-garde cultural aristocracy. He captured every vital moment, from Jack Kerouac reading poetry to Bob Dylan hanging out in Sheridan Square to Andy Warhol filming in the Factory, to the Stonewall rebellion. Born in Brooklyn, McDarrah bought his first camera at the 1939 World’s Fair in New York City. He served as a U.S. Army paratrooper in Occupied Japan at the end of World War II, camera usually in hand, and then earned a Journalism degree from New York University on the G.I. Bill. 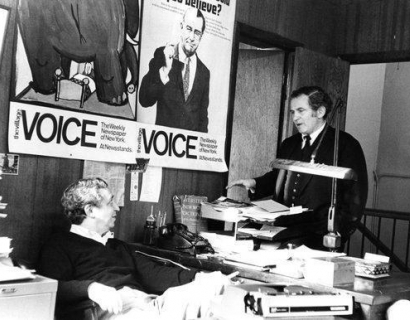 When a neighbor, Dan Wolf, told McDarrah that he and Norman Mailer were starting a newspaper to be called The Village Voice, McDarrah signed on. He was associated with the paper for the rest of his life. Fred W. McDarrah’s photographs have been exhibited at numerous museums, including the Museum of Modern Art, the Whitney Museum of Art, the Albright–Knox Art Gallery, and the Centre Georges Pompidou. His work is found in numerous private and public collections including the Museum of Modern Art, National Portrait Gallery, the J. Paul Getty Museum, The National Gallery of Art and the San Francisco Museum of Modern Art. 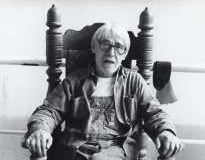 He was the recipient of a Guggenheim Fellowship in 1972. 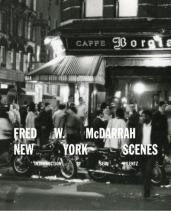 McDarrah’s previous books include The Beat Scene (1960), The Artist’s World in Pictures (1961), Greenwich Village Guide (1963), New York, New York (1964), Kerouac and Friends: A Beat Generation Album (1985), Gay Pride: Photos from Stonewall to Today (1994), Beat Generation: Glory Days in Greenwich Village (1996), New York Stories (2001), Anarchy Protest and Rebellion & The Counterculture That Changed America (2003), and Artists and Writers of the 60s and 70s (2006). SKG artist Fred W. McDarrah is included in the Museum of Modern Art's exhibition Judson Dance Theater: The Work is Never Done. 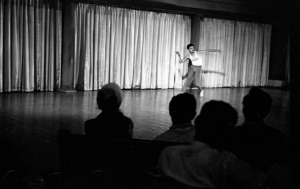 The exhibition traces the history of the the theater through live performance, film, photography, sculpture, musical scores, poetry, and archival materials from artists such as LeRoi Jones, John Cage, Robert Rauschenberg, and many others. Opening September 16, 2018. The Parrish Museum's recent acquisitions of Fred W. McDarrah's photographs are on view in a new exhibition in Water Mill, NY. Indy East End writes, "The mostly candid photographs show artists at storied New York gathering places, at exhibition openings, and in their studios as well as well as on the East End, where McDarrah and many of his subjects lived and worked. 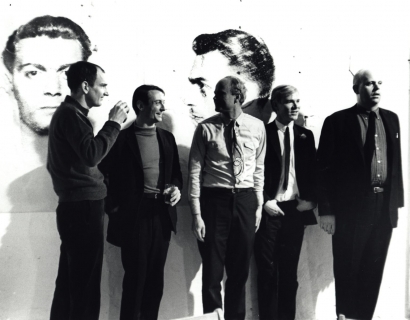 Dating from 1959 to 1979, the images depict artists who contributed to the rich creative legacy of this area including Norman Bluhm, James Brooks, Elaine and Willem de Kooning, Roy Lichtenstein, and Robert Motherwell, all of whom are represented in the Parrish permanent collection." The exhibition — on view from Sunday, November 11, through October 3, 2019 —leads with the trio of recent acquisitions, which includes a series of 27 iconic artist portraits by photographer Fred W. McDarrah, paired with examples of works by the artists pictured. 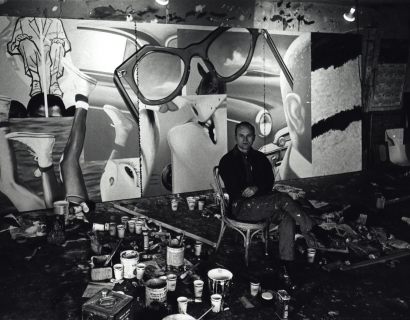 The legacy of the East End dominates a portion of the series, with Norman Bluhm at work in his studio and the familiar faces of Willem and Elaine de Kooning, Roy Lichtenstein and Robert otherwell, all of whom live on in the Parrish permanent collection. 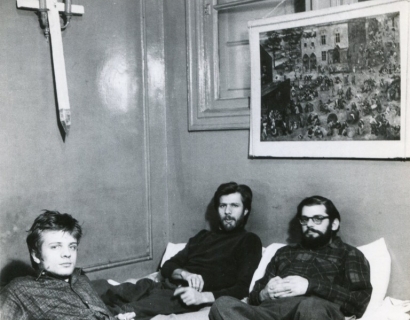 Fred W. McDarrah: New York Scenes was reviewed by Riot Material's Phoebe Hoban. Hoban writes, "McDarrah’s photographs, shot in a spontaneous cinema verite style, dramatically capture the icons of the moment: the AbEx painters and Beat poets and writers of the 1950s, the Pop artists and folk singers of the 1960s, the activists and politicians of the 1960s and 70s: a virtual who’s who of visual, literary and sociopolitical giants... The old adage, one picture is worth a thousand words, scarcely does justice to McDarrah’s classic work, a panoply of historically-loaded imagery." 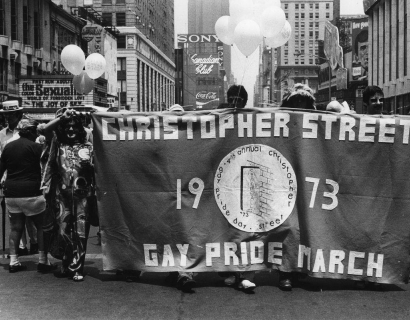 Fred W. McDarrah’s iconic photos are being republished in a new book titled "Pride: Photographs after Stonewall." Almost 25 years after the first edition was published, the new book will release in May 2019, just a month before the 50th anniversary of Stonewall. 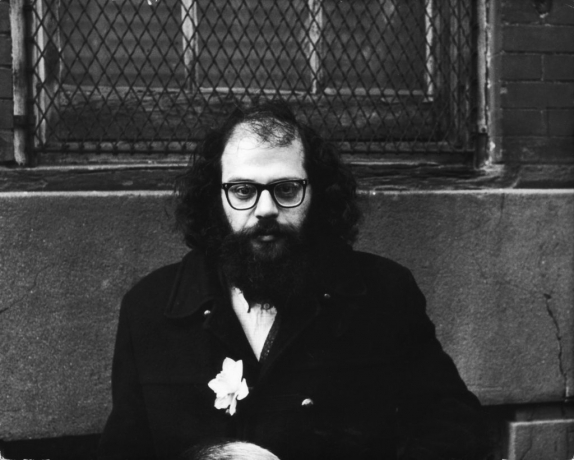 The book features several photos that weren’t published in the first iteration of the book, and a new foreword by New Yorker critic Hilton Als, along with essays by Allen Ginsberg and Jill Johnston. Fred W. McDarrah: New York Scenes is featured in AnOther Magazine. Writer Miss Rosen sits down with Fred's son Tim, to discuss the golden age of Greenwich Village and the Village Voice. She writes, "McDarrah’s New York is a comet casting through space, a fiery mass of humanity in the final decades of the second millennia. Whether documenting Carolee Scheneemann’s first performance of Interior Scroll or shooting firefighters rushing into a townhouse after the Weathermen accidentally set off a bomb, McDarrah was on the scene with camera in hand, ready to capture it all." Fred W. McDarrah's photographs are featured in The New York Times in a piece titled "Seven Ways the Village Voice Made New York A Better Place." Reporter John Leland discusses the newspaper's efforts to create social change in New York, including vanquishing Tammany Hall, exposing corrupt politicians and landlords, giving a platform to feminists, and covering racial violence. Fred W. McDarrah: New York Scenes was written up in The Gothamist's Arts & Culture section. "For decades, Fred W. McDarrah was the only staff photographer at The Village Voice (RIP), a job he took on after working in ad sales at the paper. He captured New York City in an era that brought us Bob Dylan, the Stonewall riots, the Beats and bohemians. His images capture the energy of the most vibrant decades of the greatest city in the world." Fred W. McDarrah: New York Scenes is featured in GQ Italia. 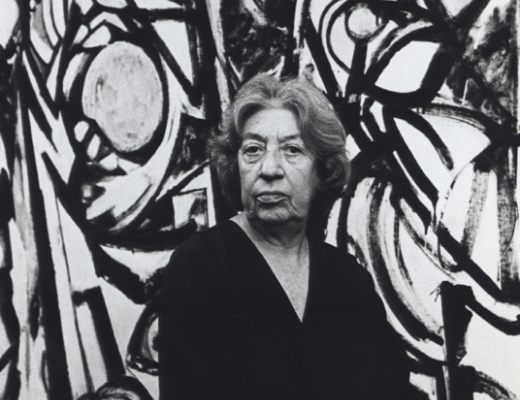 The feature includes selections from the exhibition and hones in on McDarrah's influence on New York's arts and culture scene. "The fact remains that since the mid-fifties, in the city in which he had taken the first steps, McDarrah has told every artistic, political and cultural ferment. 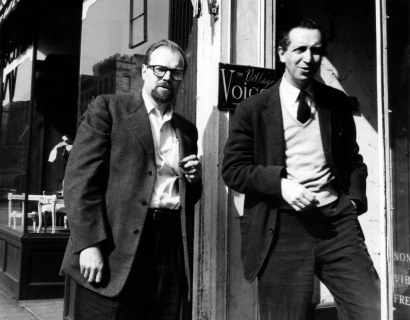 Become a photographer of the Village Voice, has immortalized, among others, the beginnings of Bob Dylan, Jack Kerouac, Andy Warhol and Allen Ginsberg. Fred W. McDarrah: New York Scenes is featured in Daily Mail online. 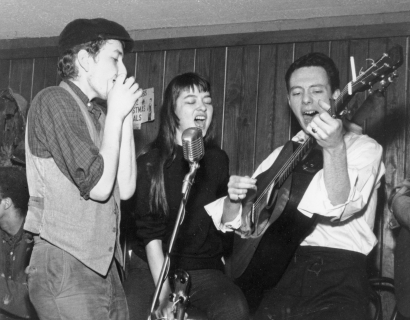 The piece, titled "Beatniks, bohemians and Bob Dylan" discusses McDarrah's "fun-loving, yet candid" images of New York that span the 1950s to 1970s. 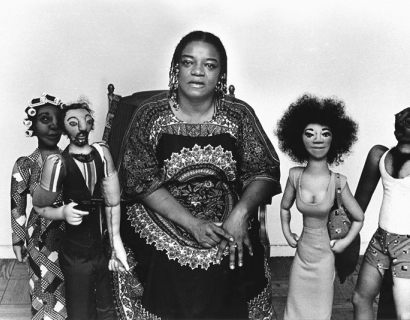 "McDarrah's photos were the graphic expression of the Village Voice. He covered Gotham's diverse downtown scenes where he frequented galleries, cafes, bars and bookstores where artists and musicians often gathered." Nearly 100 of these scenes are featured in the exhibition, on view until November 3. Fred W. McDarrah: New York Scenes is featured in The Eye of Photography. 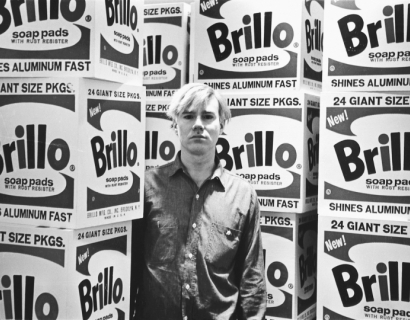 Along with this 1964 image of Andy Warhol at the opening of his exhibition "The Personality of the Artist," the article includes several selections from the show. The exhibition includes McDarrah’s most iconic images alongside never-before-seen work from his extensive archive that span the late 1950s to the mid-1970s. On view until November 3.